Dystopian teen flick. Bunch of teen boys find themselves in a huge clearing surrounded by high walls on the other side of which is a vast ever-changing maze. Food and provisions are sent in to them at regular intervals, so the big question is should they stay or should they try and escape? It's Logan's Run meets Lord of the Flies filtered through modern Big Brother culture. It's also one of the many slew of teen flicks that have arrived on screens in the wake of The Hunger Games. 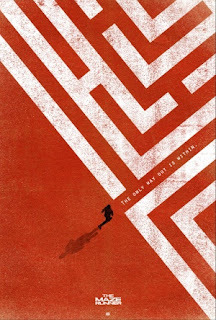 The Maze Runner rattles forwards at a fair old pace, the acting is pretty good (especially Will Poulter) and visually it's quite a treat too. Bit too scary for anyone not quite into their teens, but otherwise perfectly good Saturday night fluff.